The War Within: Dissent During Crisis in America examined issues of war, peace, dissent and dialogue during critical periods in the 20th century when free speech and civil liberties were threatened. The exhibit explored the Japanese internment during World War II; conscientious objectors, also during World War II; student protests during the Vietnam War and McCarthyism during the Cold War. The exhibit was curated by Steve MacLeod, Public Services Coordinator for the Libraries' Special Collections and Archives. 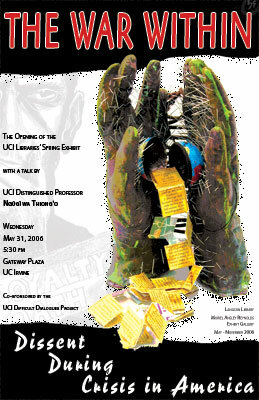 The opening event was held on May 31, 2006, and was co-sponsored by the UCI Difficult Dialogues Project.